Residents, police and politicians are brainstorming ways to make a notoriously dangerous road a little safer. 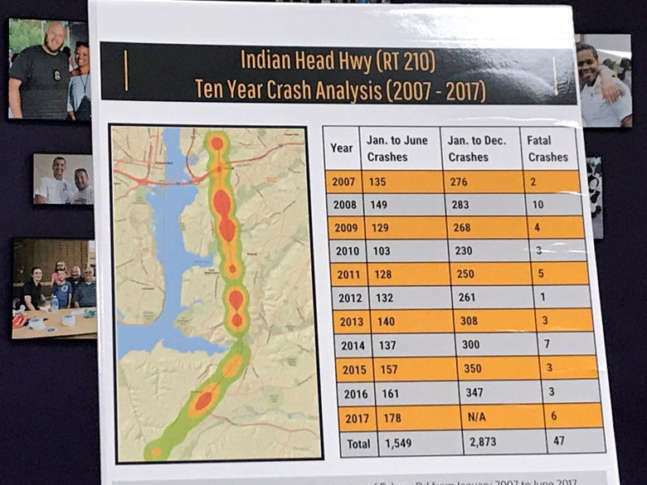 Indian Head Highway has claimed the lives of about 60 people over 10 years, according to an analysis. WASHINGTON — There have been 47 fatal crashes on Indian Head Highway/ Md. 210 in Prince George’s County since the start of 2007, according to a 10-year analysis by the Maryland Highway Safety Office. Those crashes have left about 60 people dead. “We don’t want our next ten years to look like this. That’s what we’re trying to change,” said the Rev. Robert Screen at a community meeting held Monday night at the Prince George’s County Police District 7 station in Fort Washington. Screen, other concerned residents, police and politicians are discussing potential ways to make the highway safer. One way is through stepped up police enforcement, and during the meeting, Acting District 7 Commander Jim Keleti announced that an enforcement operation was planned Tuesday along the dangerous road. He did not provide more specific details. Keleti said so far this year, his officers have written thousands of tickets to drivers on the highway. “We have written probably about 2,800 citations on 210. Last year, we wrote 3,663 citations, so most likely we will be outdoing that number,” he said. Another proposed change would allow Maryland State Police to patrol the highway. An agreement between state and county police created in 2000 says only county police have jurisdiction there. Also under consideration is increasing the fines for some traffic violations, an issue State Sen. Anthony Muse, D-Prince George’s, said he can work on. “Sometimes, unfortunately, it’s not just when you hit people in the heart, but when you hit people in the pocketbook. Then they’ll begin to respond,” Muse added. Another idea — mobile speed cameras — is something Screen would like to see on Indian Head Highway. “I see the savviness of drivers. When they see something stationary, everybody’s an angel. Everybody slows down. They do. But right after that, it’s off to the races,” he said. More meetings are planned to discuss how to protect motorists and passengers on Indian Head Highway.